Wisdom of Life. : What is love? If a husband hugs n kisses u before he leaves the house,but the next moment when he comes across something unpleasant outside the house n shouts back at u,is that love ? 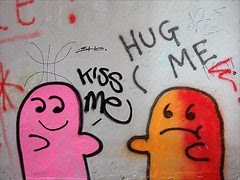 or do u still looking forwards to his hugs n kisses ? The above question was commented and asked by one reader. Mmmmmm! Sounds tricky here! Let me have a short to it. To me love is beautiful. Love is patient. Love is kind. It does not envy, it does not boast, it is not proud. It is not rude, it is not self seeking, it is not easily angered, it keeps no record of wrongs. Love does not delight in evil but rejoices with the truth. It always hopes, always perseveres. LOVE never fails. This is how I personally look at it. The husband could be at wrong. A loving person should not be rude and easily angered. Similarly the wife who loves her husband, should have patient and keeps no record of wrongs on him. After all, no person on earth is perfect. I claimed to understand much on love but I still made mistakes. Last nite I was angry when my little darling rejected me for another friend's call. I should not be angry and hopefully she should be more thoughtful and kinder to me in future. Whatever the argument, we should not delight in evil thoughts but rejoices with the truth. As long as we follow the definition of love, attempt to understand and practise them, hopes will perseveres. Love never fails because it has the magic to light up our lives. I hope that particular reader who asked, is satisfied with my simple explanation. Yes! Certainly you should look forwards to his hugs and kisses again. I pray my little darling would still hug and kiss me too. Thank you 4 ur.comment n explaination.I certainly look forward 4 his hugs n kisses,but sad to say he had left me last year,must be in the heaven now.L would rather believe that he loved me but in an unique way. Sorry to hear this from you. Although you might not be able to touch and see him, love could be felt. Nothing is permanent, except death. Learn your mistakes coz mistakes are our teachers of life. Thank you for reading my blog.